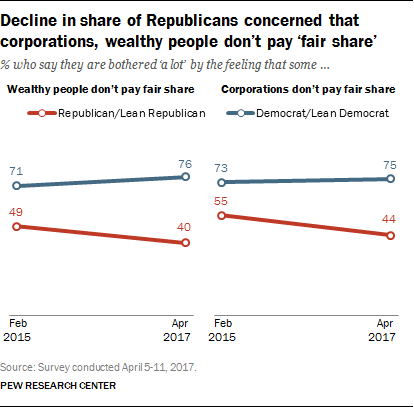 Among the public overall, 62% say they are bothered “a lot” by the feeling that some corporations don’t pay their fair share of taxes, and 60% say the same about some wealthy people not paying their fair share. About four-in-ten (43%) say they are bothered a great deal by the complexity of the system. But with the April 18 tax filing deadline approaching, only about a quarter (27%) say they are bothered a lot by the amount they pay in taxes. And just 20% say that about the feeling that the poor do not pay their fair share of taxes. 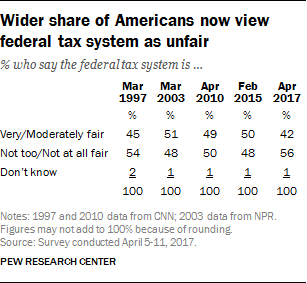 The latest national survey by Pew Research Center, conducted April 5-11, 2017 among 1,501 adults, finds an increase in the share saying that the tax system is unfair, largely because of a shift in opinion among Democrats. Currently, a 56% majority describes the federal tax system as either not too fair (29%) or not fair at all (27%). Fewer (42%) say it is very fair (2%) or moderately fair (40%). In both 2015 and 2010, opinion about the fairness of the tax system was evenly divided. Today, 54% of Democrats and Democratic-leaning independents say the tax system is not too fair or not at all fair, up from 43% two years ago. Most Republicans and Republican leaners (58%) also view the system as unfair; these views are little changed since 2015. The survey finds little change in recent years in people’s views about the fairness of their own tax burden. Just over half (54%) say they pay about the right amount in taxes, considering what they get from the federal government, while 40% say they pay more than their fair share. Only 5% say they pay less than what they should. Overall, attitudes about personal tax burden have changed very little since 2010. In 2000, a majority of Americans (55%) said they paid more than their fair share of taxes, while just 41% said they paid about the right amount. 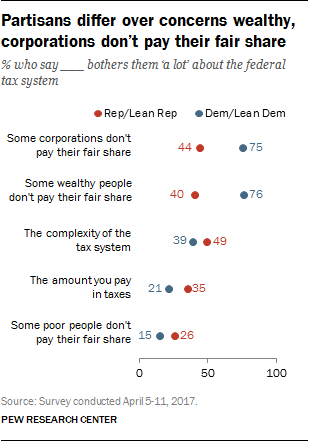 Democrats are far more likely than Republicans to say they are bothered “a lot” by the feeling that some corporations don’t pay their fair share of taxes (75% vs. 44%). And the gap is about as wide over the feeling that some wealthy people don’t pay their fair share (76% vs. 40%). While the feelings that corporations and the wealthy do not pay their fair share are by far the top frustrations among Democrats, no single concern stands out among Republicans. No more than about half say they are bothered a great deal by the complexity of the tax system (49%), the feeling that corporations fail to pay their fair share (44%), or the feeling that some wealthy people do not pay their fair share (40%). People’s own tax burdens are not a leading concern in either party, though Republicans and Republican leaners are more likely than Democrats and Democratic leaners to say they are bothered a lot by the amount they pay in taxes (35% vs. 21%). 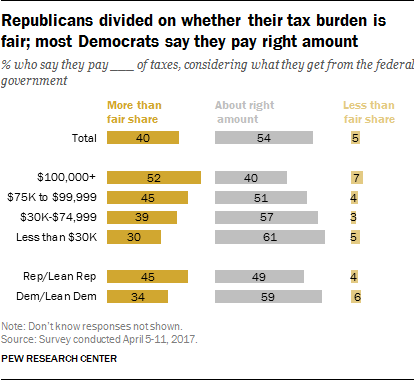 Just 26% of Republicans and 15% of Democrats say they are bothered a lot by the feeling that some poor people do not pay their fair share. This is the lowest-ranked concern among both Republicans and Democrats. Overall, concerns about how the tax system functions have changed little since February 2015. But on the two top concerns, the partisan gap has increased, largely because of changing attitudes among Republicans. Two years ago, a 55% majority of Republicans said they were bothered a lot by the feeling that some corporations did not pay their fair share of taxes. Today, 44% of Republicans express this concern. Among Democrats, there has been virtually no change in the share saying they are bothered a lot by corporations not paying their fair share (73% then, 75% today). Similarly, today, a smaller share of Republicans is bothered a lot by the feeling that some wealthy people do not pay their fair share of taxes (49% in 2015, 40% today). Again, there has been little change among Democrats in this view (71% then, 76% today). 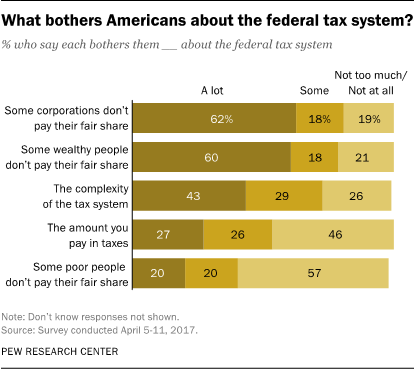 Most Americans at all levels of income say they are bothered a lot by the feeling that some corporations and wealthy people do not pay their fair share of the tax burden. But the complexity of the tax system is more of a concern among those with greater annual family income than those with less in annual earnings. About half of those with family incomes of $100,000 or more (53%) are bothered a lot by the complexity of the federal tax system, while somewhat fewer of those with incomes between $30,000 and $100,000 say the same (45%). Only about a third (34%) of those with family incomes of $30,000 or less are bothered a lot by the complexity of federal taxes. Notably, there is little variation by income level on views of the personal tax burden. Only about three-in-ten across all income categories say this bothers them a lot. The feeling that some corporations and wealthy people are not paying their fair share of taxes is more likely to be cited as bothersome by people with low family incomes than by those with higher incomes. About half of all Republicans and Republican leaners are bothered a lot by the complexity of the federal tax system, but this more of a concern for high-income Republicans than for those with lower incomes. 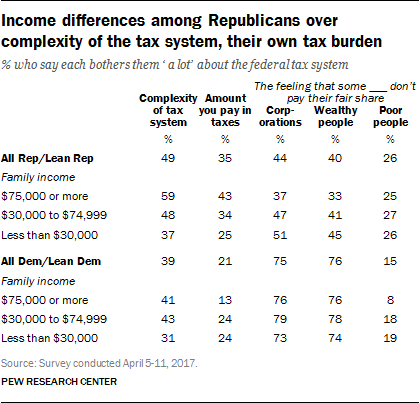 About six-in-ten (59%) of Republicans with family incomes of more than $75,000 a year say the complexity of the tax system bothers them a lot, compared with 48% of those with incomes of $30,000 to $75,000 and 37% of those making less than $30,000 annually. There also are income differences among Republicans in concerns other aspects of the tax system, including the amount they pay in taxes and the feeling that some corporations and wealthy people do not pay their fair share of taxes. 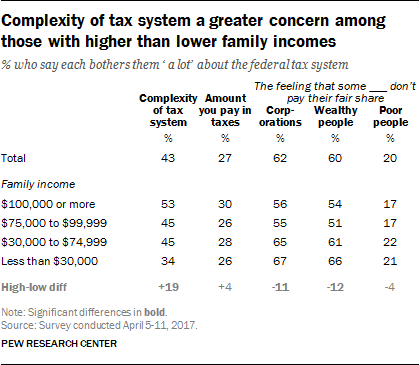 Among Democrats, there are only modest differences in concerns over the complexity of the tax system and the amount that they pay in taxes. Who thinks they pay ‘more than their fair share’ of taxes? Overall, 54% of Americans say they pay about the right amount in taxes, considering what they get from the federal government, while 40% say they pay more than their fair share. Just 5% believe they pay less than their fair share. Currently those in higher income families are more likely than those in lower income families to feel they are paying more than their fair share. About half (52%) of those with annual family incomes of $100,000 or more say they pay more than their fair share. By comparison, just 30% of those with family incomes of less than $30,000 say they pay more than their fair share. Today, Republicans are more likely than Democrats to say that they are asked to pay more than their fair share in taxes (45% vs. 33%). Two years ago, there also was a sizable partisan gap in views of people’s personal tax burden; 48% of Republicans said they paid more than their fair share, compared with 33% of Democrats. In 2011, however, majorities of both Republicans (54%) and Democrats (55%) felt they were paying about their fair share of taxes. About four-in-ten in both parties said they were paying more than their fair share (39% of Republicans, 37% of Democrats).